When it comes to legendary military rifles that have a reputation of extremely well made quality, the Swedish Mauser of 1896 will be on the list. This was the rifle that introduced the world to the very capable and successful 6.5x55mm Swedish Mauser cartridge and frankly, the ultra popular long range 6.5 Creedmoor is somewhat just a modern interpretation of the 6.5 Swede. The m/41 and m/41B sniper rifle we are discussing here is a variant of the family of Swedish Mausers. It is common knowledge that the Mauser is as a German arms company that designed and built many different bolt action rifles and semiauto pistols since the 1870s. Those Mauser designs were later exported and licensed to several different countries, Sweden being one of those that lead to the 1896 Swedish Mauser. All Swedish Mausers were manufactured by one of three companies: Mauser, Germany; Carl Gustafs, Sweden or Husqvarna, Sweden. An interesting note is that whether manufactured in Germany or Sweden all Swedish Mausers were made with Swedish supplied high-grade material known for its strength, durability and corrosion resistance. The Model 1896 chambered in 6.5×55 was adopted by the Swedes in 1896 for infantry use and production was started in 1898 at Carl Gustafs factory. The 1896 has a military two-stage trigger, a 5 round internal magazine, 29” (737mm) barrel, with an over length of 49.6” (1260mm) and weight of 8.8 lbs (4.0 kg). Though Sweden remained neutral in both world wars, in the early 1940’s with the onslaught of WWII beginning to surround them, it was identified that they were lacking in the area of sniper rifles which their neighboring Fins were using to great effect against the Russians in the Winter War. So, Sweden did as many other countries have done before and took their proven infantry rifle and mounted an optic to it. This new sniper rifle was designated the M/41 In the years of 1941-1943, about 5,300 1896 rifles were specially selected for their accuracy to be converted into sniper rifles. 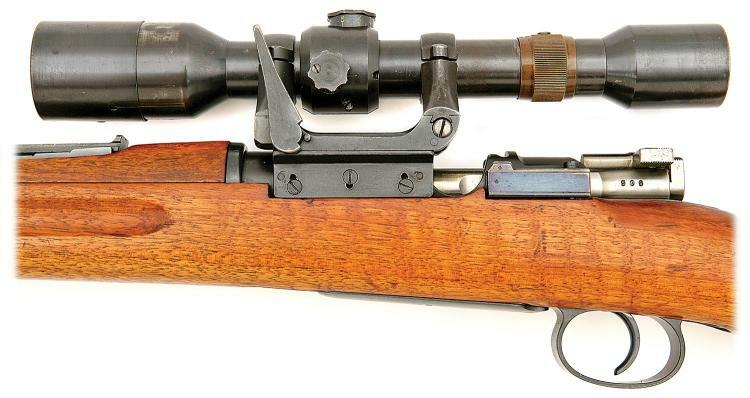 The rifle was initially equipped with the German 4×42 AJACK scope and mount which were readily available at the time. The base was bolted and pinned to the left side of the receiver and standard European rings were used for mounting the scope. These scopes and mounts were used until the Germans stopped supplying them in 1943. From that point, and through the rest of the war, a Swedish produced scope, first the AGA 42 and then the AGA 44, both of which were a 3x scopes, were mounted to the m/41 rifles. Because of the scope, the rifle’s bolt was turned down to provide proper clearance and manipulation. Beginning in 1955, the Swede’s decided it was time to standardize their sniper systems. Since Germany was no longer at war, Sweden was once again able to acquire the superior German AJACK scope and mount. There were a few of the original AJACK’s that were still in good enough condition to be used, but most were replaced. The AJACK scope has a four-power magnification, which was pretty common for that era, with a 42mm Objective lens. The reticle is standard German “picket post” style which has two horizontal stadia with a pointed center vertical post. The BDC adjustment knob, which also had a locking screw to keep it in place, internally adjusts the reticle’s elevation and is graduated from 100-800m. The scope was also equipped with a diopter adjustable focus knob in the rear. During this upgrade period, a few updates were also made to the mounting system and the designation changed to M/41B. The most prominent feature was the addition of a set screw at the front of the base, this was added to keep the scope from moving too far forward when mounted or when under recoil, this did tend to hinder the removal of the scope. At first glance most might think the camming lever would be for locking the mount into place, it is actually used to free it from the rail. The mounting screws were also changed; initially the three screws had a locking screw to help keep the main screw in place. With the remodel the main screw remained, and they just pinned the main screw to keep them from moving. 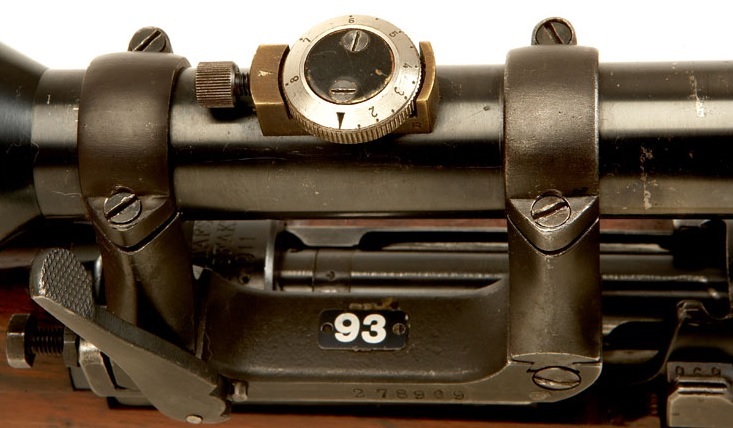 Additionally, since the scope mounting base covers the rifle’s serial number on the side of the action, they numbered the base with the rifle serial number which was not originally done with the m/41. Scopes in that era were pretty fragile, and often times were carried in a can and attached only when needed. Thus, the rifle maintained its iron sights just in case the scope was damaged, or the rifle was used without the scope. The front sight for the original m/41 was a hand fitted rectangular post that was zeroed for 300 meters, a hood protected it from inadvertent damage. The rear sight was of leaf sight design, when folded down it graduated from 300-600 meters and when flipped up its graduated from 700-2000 meters. With the remodeling of the rifle, the rear sight was changed to the SM m/55 micrometer style which was graduated by a dial from 100-600 meters and was a precision target style sight. When first issued in 1941-42, six m/41 sniper rifles were issued per company and were a standard of Swedish infantry armament. The m/41B continued in service through 1995. The last unit to utilize the m/41B was the Swedish Home Guard and they used it until it was replaced by the scoped AK4OR, a Swedish version of the H&K G3A3 fitted with a Hensoldt Fero Z24 4×24 scope. The M/41 and M/41B rifles were renowned for their exceptional accuracy and quality for a rifle built during that period. This reputation is well deserved and the smoothness of these rifles is impressive even today. I have a CG-80 by Norma in .308 Win, with a Shultz& Larson barrel. Does anyone know what it would be worth? The m96 is a extremly good rifle . Do you know the ballistic coefficient of the old 1941 prickskytte rounds for these rifles? Are they the 139g scenar bullets?